Christine Michira is a partner in our Nairobi office and is Head of the Kenyan Banking and Finance Department. Christine advises on all types of securities transactions, with her practice covering equity, debt, financial regulatory and governance, structured finance and securitisation transactions and the full range of derivative products. She has advised on nearly every type of capital markets offering. Issuers, underwriters and private equity sponsors of all sizes across a range of industries rely on her to help them raise millions in proceeds through a broad array of securities products, from the standard to the most innovative and complex. Her background also enables her to offer a full range of advice on insurance services, including transactional, regulatory and commercial matters. She represents startups and established multinational life and non-life (re)insurers, intermediaries, banks, capital providers (including hedge funds, private equity funds and venture capital funds), regulators and other insurance industry participants. A key strength of her practice is the ability to offer technical expertise, a wealth of experience and regular contact with listing authorities and regulators. 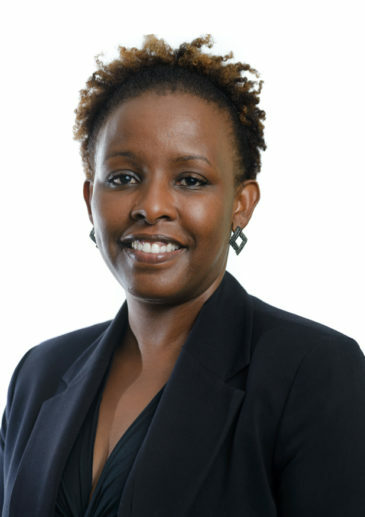 Before going into private practice, she served as the Head of Legal and Compliance at the Nairobi Securities Exchange Limited, the Head of Legal Affairs and Authority Secretary at the Capital Markets Authority and Director, Legal at both Renaissance Capital (Kenya) Limited and Equity Investment Bank Limited. She is certified by the Commonwealth Secretariat, the Centre for Corporate Governance and the Institute of Directors (Kenya) as a trainer in corporate governance. She has also been trained by the International Finance Corporation of the World Bank Group in board evaluation and has been extensively involved in the training of directors in the areas of legal duties, strategy and reporting. She is also a director of Deacons (East Africa) PLC. Christine has over 20 years’ post-qualification experience and is also a member of the Law Society of Kenya, the Institute of Directors (Kenya) and the Institute of Certified Public Secretaries of Kenya. She has a MBA and a LLB degree from the University of Nairobi, Diploma in Legal Practice from the Kenya School of Law and a Certificate in Corporate Governance from CPS, Kenya. Advising Mayfair Bank Limited (in formation) on its application for a banking license from Central Bank of Kenya. Advising on a proposed acquisition by IFC of a 10.37% equity stake in Britam Holdings Limited by way of subscription for newly issued ordinary shares. Advising Britam Holdings Limited on a proposed acquisition of 10.37% equity stake by way of subscription for newly issued ordinary shares by IFC. Advising a listed financial services company on the proposed acquisition by a consortium represented by a private equity fund of an equity stake in the client by way of subscription for newly issued ordinary shares. Advised NIC Group PLC on a proposed re-organization that would allow a listed non-operating holding company which owns shares in a subsidiary that is licensed to undertake banking business in Kenya, subsidiaries that engage in non-banking activities in Kenya and subsidiaries licensed to undertake banking businesses in other jurisdictions. Advised Plum LLP on the acquisition of 23.34% of the total issued shares of Britam Holdings Limited from the Government of Mauritius. Advised CDC Group Plc on the acquisition of approximately 10.68% stake in I&M Holdings Limited by CDC Group Plc (KES 5 billion). Advised Actis LLP, private equity fund, on its investment in Umeme Limited, a public company listed on the Ugandan Securities Exchange (USE) and cross listed on the Nairobi Securities Exchange Limited (NSE). The exit was by way of cross border sale of shares to institutional investors and management by way of private placement across the NSE and the USE. Advised Standard Charted Bank PLC and Standard Charted Bank Kenya Limited in respect of the financing of Philips Medical Systems Nederland B.V. for supply and maintenance of medical equipment to the Government of the Republic of Kenya under the Managed Equipment Services Programme (MESP). Advised Umati Capital on the Legal and regulatory requirements for undertaking invoice discounting and supply chain financing on a digital platform and the requirements for marketing asset backed securities in Kenya. Advised Britam Holdings Limited on a legal and documentation audit in respect to its real estate property interests and related entities. Acted as legal counsel to Resolution Group Limited on the further additional investment by LeapFrog Financial Inclusion Fund II, LP in Resolution Insurance Limited, a wholly owned subsidiary, by way of a convertible loan of KES 1 billion. Acted for Abu Dhabi Commercial Bank PJSC, The Commercial Bank (Q.S.C), Mizuho Bank Ltd, AL Ahli Bank of Kuwait K.S.C.P, Commerzbank Aktiengesellschaft Filiale Luxemburg, Emirates NBD Bank PJSC, Standard Chartered Bank, AfrAsia Bank Limited and Doha Bank Q.S.C. as counsel to a syndicate of lenders in respect of the dual tranche term loan facilities to be made available to CfC Stanbic Bank Limited for total commitments of up to USD 155 million for Tranche A and USD 200 million for Tranche B to finance the general corporate purposes of the CfC Stanbic Bank Limited, including but not limited to trade-related finance. Conducted a study of the current legal frameworks in each of the East African Community member states, and undertook a gap analysis for the desired legal framework and made recommendations for legislative changes and the legal roadmap to attaining integration of mobile financial services within the East African Community. Advised British American Investment Co. Kenya Limited (BRITAM) on its acquisition of 25% stake in Housing Finance Company from Equity Bank Limited and then on the acquisition by BRITAM of further shares in the issued share capital of Housing Finance, which increased BRITAM’s current shareholding in the company to approximately 49%. Advised Standard Chartered Bank Limited, London and Standard Chartered Bank Kenya Limited, on a USD 275 250 000 multi-currency secured structured trade commodity banking facilities in respect of heavy fuel oil and other petroleum products advanced to Gulf Energy. Advised Centum Investment Company Limited a company listed on the Nairobi Securities Exchange on the dual listing of its shares on the Ugandan Securities Exchange, as part the company’s expansion programme. Advised Centum Investment Company Limited on the public and listing of KES 6 billion senior unsecured fixed rate notes and senior unsecured equity linked notes on the Nairobi Securities Exchange Limited. Advised East African Breweries Limited listed on the Nairobi Securities Exchange Limited in connection with the issue and listing of unsecured medium term notes of up to KES 11 billion. This was privately placed. Christine was a panellist at the 2017 IOD Corporate Governance Conference, where she discussed “Corporate Governance as an agent of change in Kenya”. Christine was a panellist at the 2017 Fintech in Africa Conference where she discussed “Developments and Trends in Fintech Regulations in Kenya”. Chambers and Partners, 2018 ranked Kamami in Band 3 for Banking and Finance. IFLR1000’s 2018 Financial and Corporate Guide rated Kamami as a Highly Regarded Lawyer for Capital markets, Financial services regulatory and Private Equity. In 2017, Christine Kamami was selected as a panelist at the IOD Corporate Governance Conference, with the theme “Corporate Governance as an agent of change in Kenya”. Chambers and Partners 2017 ranked Christine in Band 3 for Banking and Finance. Legal 500 2017 lists Christine as a recommended lawyer for Banking and Finance. In 2016, Christine has been recognised as leading lawyer in Capital Markets, Financial Services Regulatory and Private Equity by IFLR 1000. CMA REGULATORY SANDBOX: READY TO PLAY? Regulation of interest rates: Where are we? Have your securities over movable assets been registered in the Collateral Registry?